The “bottomless” NFL Concussion Settlement, once regarded by NFL retirees as the conclusion to a long, hard fought race has devolved into a marathon maze laden with hurdles that appear to obscure any semblance of a finish-line. On August 15 a motion was filed asking the Court to determine proper administration of claims under the settlement agreement. 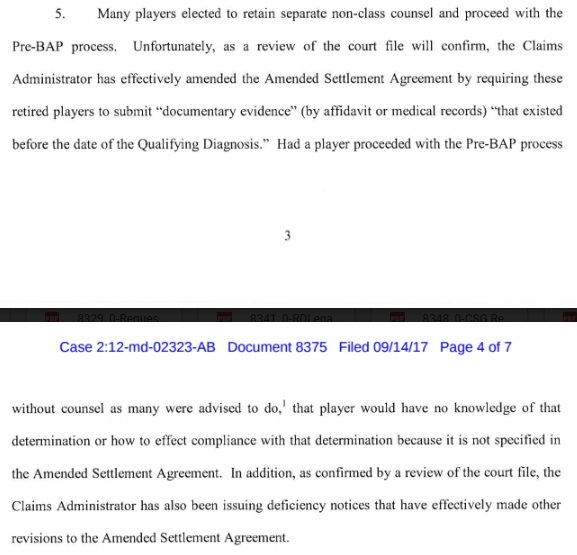 The assertions made in this motion claim additional unwritten language read into the Settlement Agreement amount to a de facto amendment to the settlement which implements additional requirements for players to obtain an award. Since this motion was filed, other law firms representing hundreds of former players and their families have filed motions asserting similar claims or have filed joinder with the motions before the court. The problem in this statement is that generally contracts and agreements are to be interpreted in accordance with the language plainly written in the actual agreement. 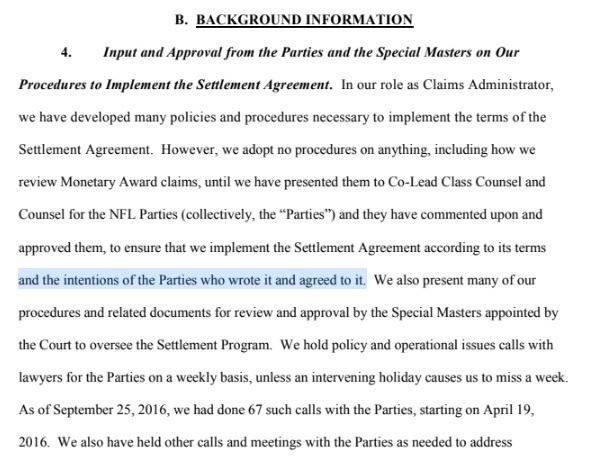 Mr. Brown states that the settlement is being administrated according to “the intentions of the Parties [NFL and Co-Lead Class Counsel] who wrote and agreed to it.” The problem with this, however, is that if the intentions are not clearly written into the Settlement Agreement, that no Class Member or their legal counsel can know what those intentions might be. Prior to the beginning of claims submission, numerous legal experts expressed the opinion that the NFL would never enter into an un-capped agreement unless they had determined a way to control costs and mitigate their losses. 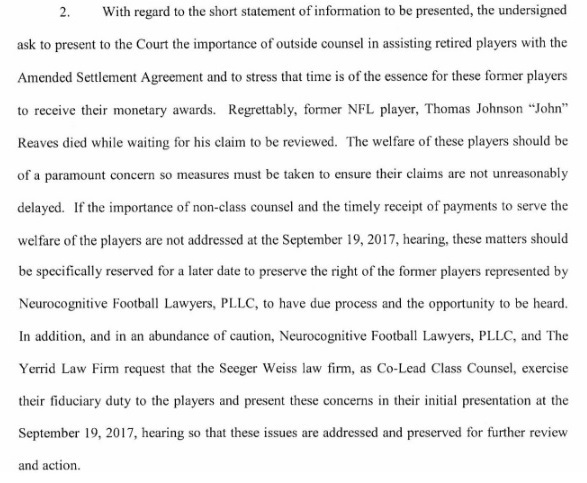 Despite assurances to Class Members that claims processing would not resemble the denial-laden type of processing that has plagued NFL Disability claims, it appears that at least thus far in the settlement, they are borrowing the Disability Board’s playbook and using it almost verbatim. 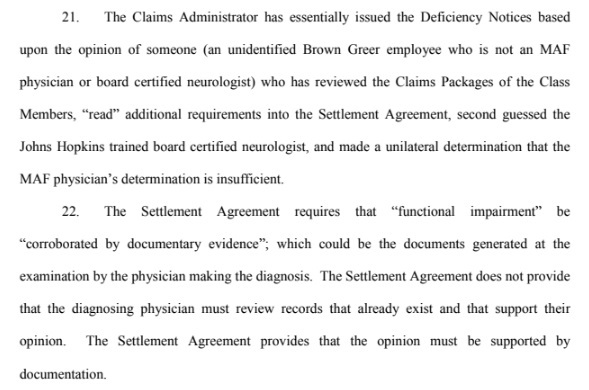 The players who received deficiency notices described in the motion from X1 Law and Loren & Kean Law received pre-settlement date qualifying diagnoses by a board-certified neurologist as mandated in the Settlement Agreement at 6.3(c). As pointed out in the motion, “The criteria Claimants must meet for a Qualifying Diagnosis depends upon when and how they are diagnosed, and certain requirements are more stringent than others.” The fact that pre-settlement date qualifications according to the Agreement are less stringent is completely reasonable. Levels 1.5 and 2.0 dementia are not medically recognized standards and therefore will not exist in any pre-settlement documentation. 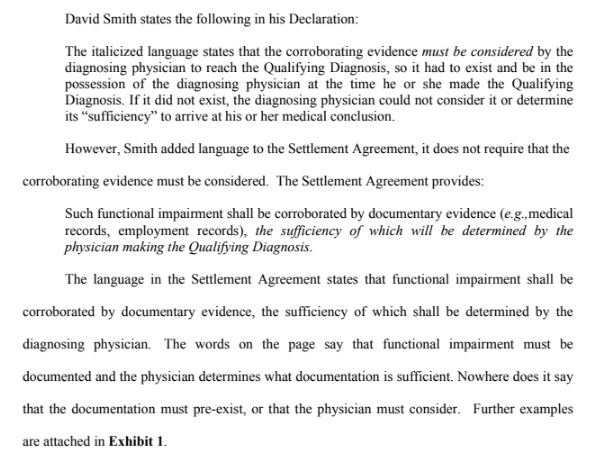 Those players diagnosed prior to the settlement will have medical records reflective of their doctors’ medical conclusions in accordance with standards of medical practice, however these doctors were not writing to try to frame their diagnoses within carefully worded and crafted criteria defined in the Settlement, where as those who are diagnosed later will have the benefit of these guidelines to present to their physicians. The standard for pre-settlement diagnoses was to be weighed as “generally consistent” with the post-settlement standards but not verbatim as it appears claims administration now requires. A major sticking point in the deficiency notices is corroborating pre diagnosis evidence which is likely non-existent for some of these players. As Susan Owens pointed out when speaking of her husband R.C., he waited to go to a neurologist until his fear of getting lost and found by someone aside from his wife outweighed his reluctance to face a doctor and hear what he did not want to hear. He was in late-stage Alzheimer’s at the time of his diagnosis, and after being diagnosed, Susan was not allowed to discuss his diagnosis with anyone. In cases such as this (and there are many – numerous players do not want to be identified publicly as mentally impaired) there may not be other documentation to support the neurologist’s conclusions through people outside the family who may not have been privy to the player’s declining mental state. 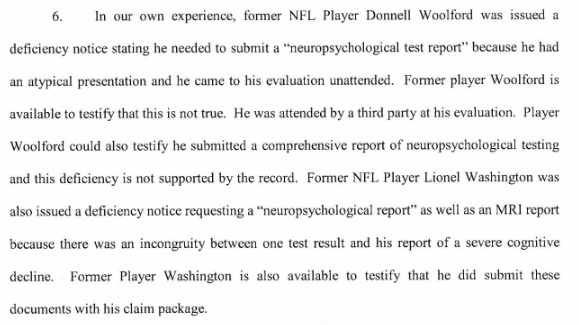 In this instance, when the board-certified neurologists’ diagnoses were considered insufficient, players’ counsel sent the medical records for a second opinion – that of one of the Settlement designated MAF neurologists, who concurred with the diagnosing physician’s statements. His diagnosis was kicked back, however because he relied on interpretation of various diagnostic tests and notes from the examining physician, as opposed to physically examining the players. This is not an unusual occurrence in medicine. Often doctors will send records to other specialists to diagnose or confirm diagnosis without requiring every doctor who examines test results to physically see the patient. On September 14, two Florida law firms Neurocognitive Football Lawyers and Yerrid Law, filed a motion requesting to be heard and address the court at the scheduled September 19, hearing in regard to deficiency notices and improper administration of claims. In the motion, the attorneys pointed out that one player they had represented died while waiting for his claim to be processed. Judge Brody never officially ruled on the motion but did so unofficially as no one outside of Class Counsel was permitted to address the court on behalf of players at the scheduled hearing. 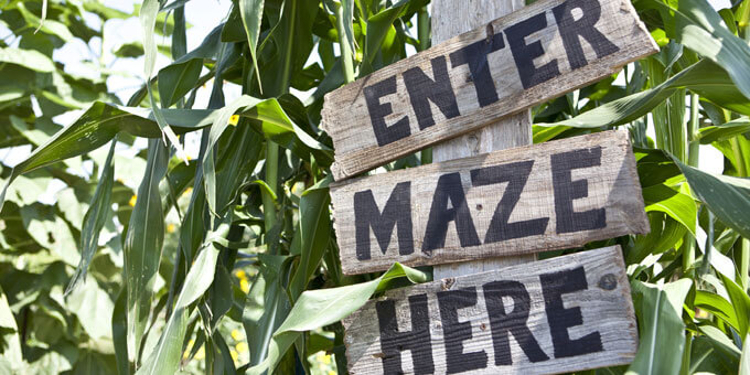 The Florida law firms make the same assertions as the X-1 motion and also state that the difficulty and confusion is perplexing to lawyers and contemplate how players who are self-represented might have any chance of navigating the maze. These claims are very consistent with reports I’m receiving from individual players and their families. One player upon condition of anonymity because he fears retaliation, forwarded me his deficiency notice as well as his doctor’s letter of diagnosis and Physician Certification Form, which also includes his diagnosis date of November 1, 2006. My initial thoughts regarding this deficiency went to a typographical error somewhere in the medical record, but after contacting the player’s counsel, the deficiency seems more insidious. 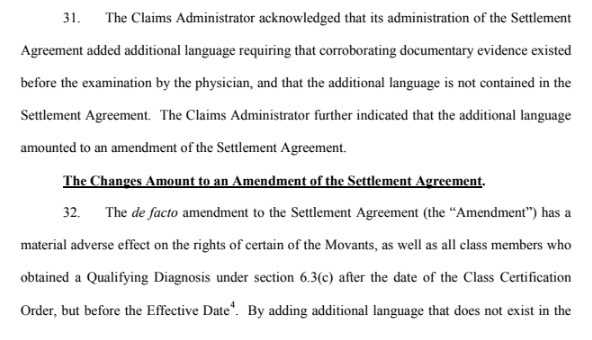 It appears the claims administrator is trying to push back the doctor’s diagnosis to a later date, presumably in order to qualify the claim at a lower payout since according to the Settlement, awards decrease as age at diagnosis increases. Another attorney has stated that the button to upload medical files to the portal has been disabled (at least for him) which prevents him from being able to upload medical files to contest or cure the deficiencies. Another under condition of anonymity told me that he feels claims administrators are retaliating against attorneys who make too many inquiries or object to the manner in which claims are being handled. At least based on his experience, every inquiry seems to result in another deficiency notice a day or two later. Several attorneys have expressed concern that there is a concerted multi-pronged effort to eliminate their representation of clients in the settlement. 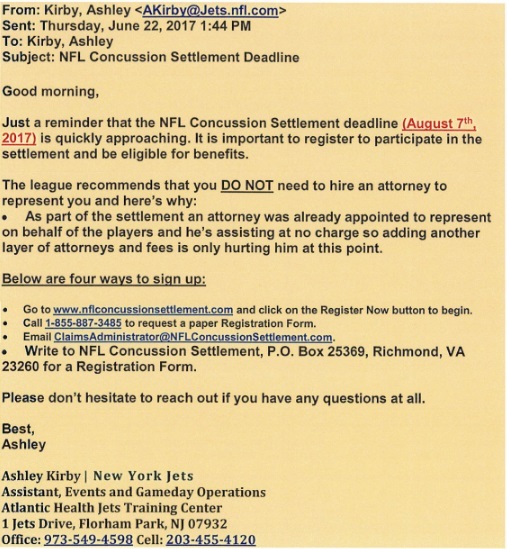 An exhibit filed with the Neurocognitive Lawyers/Yerrid Law Firm’s motion shows an email from the New York Jets to former Jets players in which they discourage their alumni from hiring private counsel. Note the reasons stated in the email: (1)”an attorney was already appointed to represent on behalf of the players.” While it is true that Class Counsel will file medical records and claims on behalf of a player, he was appointed to represent the Class as a whole and not individual players who may need specific help. (2)” another layer off attorneys and fees is only hurting him at this point.” This isn’t the players’ concern, but it should be of concern that their opposition – the NFL – wishes for them to take this route. Attorneys that I’ve spoken with have also stated that they feel there has been an effort to lump all private counsel in the category of predatory services such as those of R.D. Legal, a settlement funding lender or other questionable claims processing services in the eyes of the Court. Based on the derogatory language I’ve seen directed at many private firms in Class Counsel’s responses to their motions, I’d be inclined to concur. In this statement and throughout the brief, Co-Lead Class Counsel referred to the deficiency notices as “Notices of Preliminary Review” and framed them as beneficial to Class Members. 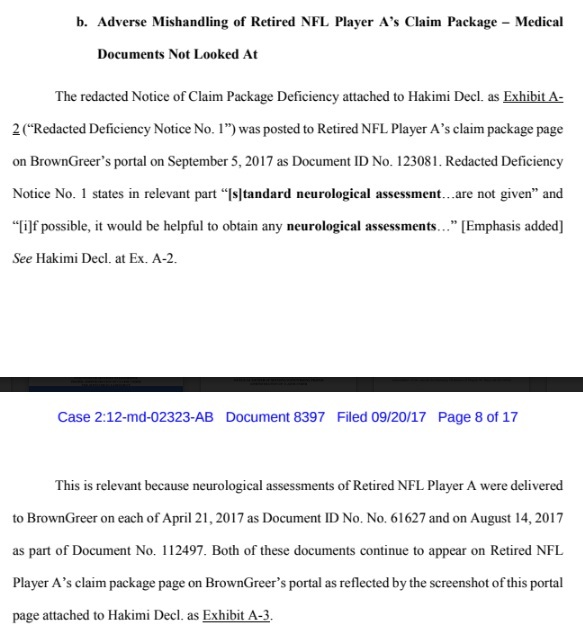 The response which was submitted on September 28, states that the original “Deficiency Notices” were confusing and thus they have been renamed “Notices of Preliminary Review.” The redacted “Notice of Claim Package Deficiency” referenced earlier, which was sent to me by a player, was dated September 29 and does not reflect this change. Technically, according to the terms of the settlement as written, failure to cure deficiency notices within 120 days will result in denial of the claim. On August 17, I participated in a conference call with Scott George, one of the attorneys at Seeger-Weiss, and he related that the deficiencies weren’t really deficiencies as described in the settlement agreement. 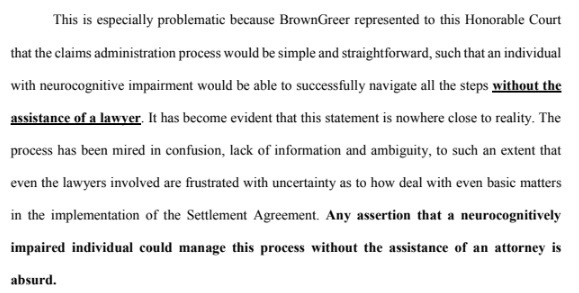 This appears to be the focus of what Seeger is stating above, but if the Settlement Agreement isn’t administrated in accordance with its written terms, who can be certain of anything that is written in it? 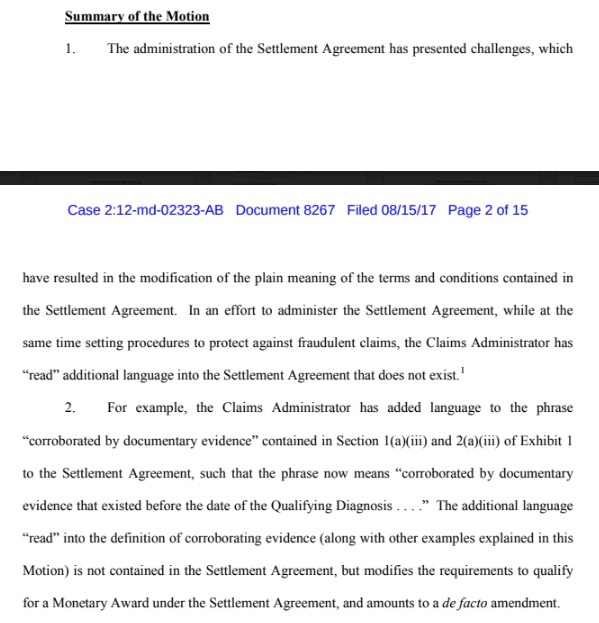 Parallel with Orran Brown’s statement, also referenced earlier, Seeger states that the process is “consistent with the Settlement Agreement.” The assertions made by all counsel who have filed motions dispute Class Counsel and Claims Administrator’s interpretations of “generally consistent” in regard to pre-settlement date and post-settlement date diagnoses. Consistent with is not identical to “as written,” which is the generally accepted standard for interpretation of contracts including Class Action settlement agreements. In re Deepwater Horizon, Brown Greer was accused of deviating sufficiently from Settlement terms as written and the Court in that case ruled his interpretation was “inconsistent with the plain text of the Settlement Agreement,” and subsequently disallowed. Until some evidence is presented to indicate otherwise, it appears those who predicted the NFL would mitigate its losses through players with dementia and Alzheimer’s diagnoses were correct. If this is the case, Judge Brody’s legacy rides on not allowing such a travesty as this to continue. Players and their families are fearful that their claims may never be approved and even if they are, their loved ones won’t live to see the likely decimated awards. It seems tragic that the settlement which once offered hope is now the source of further frustration as well as financial devastation caused by the delays. The fate of these families now rests in the hands of the Court. One can only hope that wise and merciful rulings will be issued before the damages to human lives are irreparable.